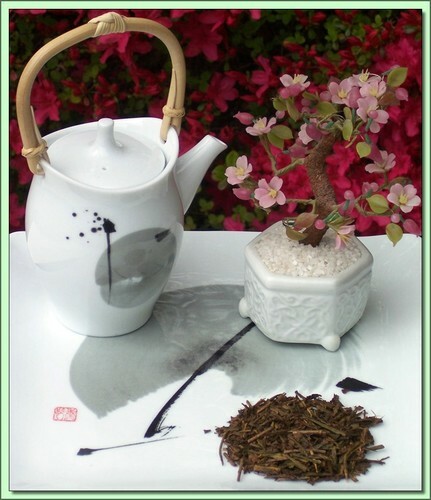 Character: Roasted green tea with full-bodied character and toasted notes. Spring and autumn Bancha crops are mixed and post fired during final processing (Houjicha). Bancha are later season crops producing tea of well-defined character, vivid yellow colors and refreshing and deep flavors. Spring crop bancha has a distinct aroma which is further heightened when roasted. Produced under ISO 14001 Certified Environmental Management Standards. This tea makes a particularly great tea incense for tea burners! Hot Tea: This tea is best enjoyed by pouring 203F/95C boiling water over the matcha powder (2-3 teaspoons per cup) for 30 seconds (longer=stronger). Don't remove the leaves. Can be infused repeatedly 2-3 times using higher temperatures & shorter infusions until flavor is exhausted.